Creative today expanded its family of wireless speakers with the two new additions of the Airwave and Airwave HD. 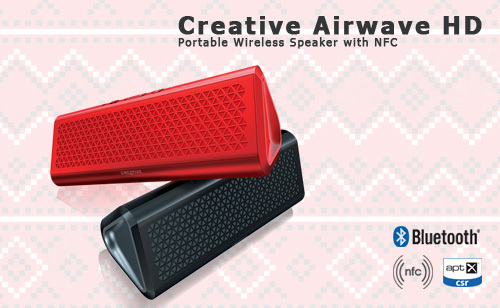 These are the first Bluetooth speakers from Creative that is NFC-ready and also the first to come with a built-in battery. The speakers also come with a fresh new design theme and smart features, a departure from Creative's traditionally black, boxy speaker design. 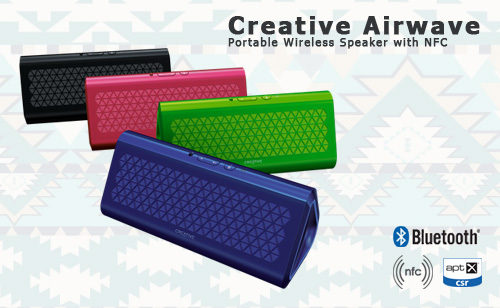 The Creative Airwave HD is the company's flagship portable wireless speaker that comes in two colors - red and black. It has 7 hours of playtime, a built-in mic and charges via the standard micro-USB connection. Besides having NFC which allows you to pair your NFC devices (mostly Andriod powered), it also has a Multipoint connection feature which allows you to pair 2 Bluetooth devices at once. The Airwave HD will retail at S$199 in June. The Creative Airwave is the cheaper version of the Airwave HD. It comes in more colors and seem to be targeted at the younger audience. The Airwave features are mostly similar to the Airwave HD with the usual NFC, Bluetooth, AUX-in connection, built-in mic and aptX codec. Strangely, the Airwave has a longer playtime of 12 hours.The Airwave will retail at S$129 in June.